Opinion: Should Ukrainians Do Away With Ukrainian Christmas? WINNIPEG, Canada -- The celebration on Jan. 7 of what is traditionally known in Winnipeg as Ukrainian Christmas could be under threat as growing numbers of personalities in Ukraine call for the holiday to be shifted to Dec. 25 alongside Western countries. Christmas Eve in the Ukrainian Tradition is celebrated on January 6 with a family feast called “Sviata Vechera” or Holy Supper. 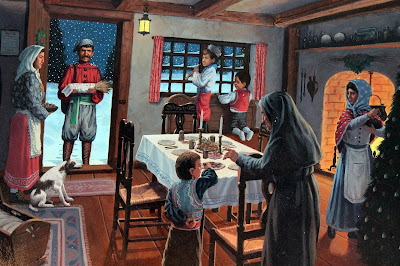 On this Eve a special shaft of wheat tied with a “Rushnyk” (Ritual Towel) is carried into the home by the head of the household (“Hospodar”) and put in a place of honor in the corner of the room as a decoration, symbolic of the after-life and the gathering together of the family at this special time of year. The movement, no longer confined to a select group of bloggers, has hardly any religious grounding. It is led by activists, authors and politicians furious about Moscow's annexation of Crimea and the pro-Russian rebellion that has wrested much of eastern Ukraine from government control. The aim is to set themselves apart from the Russian Orthodox church. And it appears to be gaining some traction. Only a clutch of Orthodox countries mark Christmas Day on Jan. 7, including ex-Soviet Russia, Ukraine, Belarus and Georgia as well as Serbia, citing the Julian calendar, which lags 13 days behind the Gregorian calendar used throughout the world, even in Russian secular matters. Orthodox countries such as Greece, Romania and Cyprus celebrate on Dec. 25 without blinking an eye. To complicate matters further, Ukraine's 6 million-strong eastern-rite Catholic church, banned by Josef Stalin in 1946 and revived only at the end of the perestroika reforms of the last Soviet leader, Mikhail Gorbachev, also celebrates on Jan 7. While Easter is arguably the most important holy day in the Orthodox calendar, Winnipeg writer Orysia Tracz says Christmas is richer in terms of traditions, such as the 12-course meatless and dairy-free Christmas Eve dinner. "Christmas traditions are older than the Easter traditions. They are linked to the paleolithic era, while the Easter ones are rooted in the spring equinox and the neolithic era," said Tracz, author of First Star I See Tonight, a book outlining Ukrainian Christmas traditions. "And when Ukrainians are asked why they stand by their Christmas traditions, the answer is very often simply: 'Because.'" In Canada, free of political or religious tension within the 1.2 million-strong Ukrainian community, Orthodox celebrations have always taken place on Jan. 7. Christmas lights have remained on at Winnipeg City Hall until the date passed. Ukrainian Catholic churches have proved more flexible, with most switching over to Dec. 25 back in the 1960s amid a minimum of fuss from dissenters citing those "back in the home country." The Ukrainian Catholic Metropolitan Cathedral (Sts. Vladimir and Olga) on McGregor Street and St. Andrews Ukrainian Catholic Church on Euclid Avenue are among the few that still offer services on Jan. 7. "From a religious viewpoint, we can keep our traditions on either calendar, so it doesn't really matter," said Father Len Ratushniak, parish priest of St. Andrews. "We celebrate both days. My parish is an old parish with older people who have lived all their lives with the old calendar. The younger members are mostly for the new way. It's no big sacrifice to have more services on the seventh just to help the old people to live their lives." In Ukraine, no less prominent a politician than Olexander Turchynov, secretary of the national security and defence council, has proclaimed the country ripe for change. "Perhaps the time has come in Ukraine to change over to celebrating Christmas on Dec. 25 along with the majority of civilized countries," Turchynov wrote on his Facebook page. It's up to Ukraine's Council of Christian Churches to make a decision, he said, while suggesting both dates could be marked for an interim period. Part of the problem lies in more than 20 years of post-Soviet growing pains. Ukraine's Orthodox Church remains split. The Russian Orthodox Church claims authority over all Orthodox believers in Ukraine and denounces as heretical the creation, in 1992, of an independent Ukrainian Orthodox Church. But the war in Donbass, in which 9,100 people have died since pro-Russian forces seized two regions in April 2014, has overturned the confessional balance of forces. The two competing churches had been roughly equal for years after the collapse of Soviet rule, but the war prompted mass defections to the young Ukrainian church. Turchynov's proposal, almost unthinkable a few years ago, sparked a flurry of debate. One television channel organized a straw poll, asking viewers when they preferred to celebrate. On the eve of the holiday, about 61 per cent of viewers who responded supported a change to Dec. 25. "Is it not proper to ask whether Ukraine should seek to celebrate common holidays with Europe, rather than Russia?" "What would reverting to Dec. 25 for Christmas give Ukraine? Firstly, a return to civilized, accepted forms of co-existence … and it would get rid of, once and for all, the imperial dependence which has tormented our souls through the distorted interpretation of the scriptures by priests serving the Kremlin." The war has galvanized public opinion against Russia, though the Kiev government remains deeply unpopular. Polls show support for Ukrainian independence and unity has risen and distinctions between Russian and Ukrainian speakers are now largely blurred. But a quick change to Dec. 25 seems unlikely. Any alteration would require endorsement from a religious body. And confessional change comes slowly in this part of the world. Father Gene Maximiuk, parish priest at Holy Trinity Ukrainian Orthodox Cathedral on Main Street, urges caution. "The celebration of the birth of our Lord is such a sacred and holy festal celebration that to engage in discussions at this time about calendar dates would only serve to distract from the joy, solemnity and majesty of the feast," he said. And all agree that whatever date is ultimately chosen, celebrations will undergo no change. "In local terms, something would be lost if the date was moved to Dec. 25. Perhaps it would lose some of its visibility," said writer Tracz. "But nobody over the years made Ukrainians do what they do at Christmas. Even if everyone switched, none of the traditions would change. Everyone would still perform them all."